Several months ago, we brought you an article that highlighted how JET Performance modifies and upgrades Rochester’s ubiquitous Quadrajet. That article got a great response, and we thought we should give you guys a better understanding of Quadrajet modifications, and how they affect the carb’s functions. To do that, we are diving into Cliff Ruggle’s book: How To Build And Modify Rochester Quadrajet Carburetors. Cartech published this book back in 2006, and it has served as a reference for many enthusiasts. Although this overview of excerpts from that book doesn’t cover all the information you’ll find within its pages, it will hopefully give you a little understanding of the carburetor. If you really want to take a deep dive into the carburetor and learn how it works and how to modify it, you really need to get the book. Carburetor number 17059202 (left) is a late-style, side-inlet Chevrolet unit showing the side fuel-inlet used on almost all Chevrolet Quadrajets. The carburetor on the right has a front inlet and sports carburetor number 17057274, indicating it is a 1977 Pontiac unit. The Quadrajet, as with any other factory-delivered carburetor, was set up specifically for a single application. The engineers designed and calibrated the entire vehicle and each component – including the carburetor – to work best within given parameters. In most cases, only a correct rebuilding is all that is needed to get the carburetor to work well in all areas – provided the engine and all associated emission equipment are still in place and operational. However, we all know this is quite rare. In the vast majority of cases, the well-meaning engine builder/tuner makes significant changes to the engine in their quest for improved performance. Once one decides to employ a non-factory intake, exhaust, and camshaft – or even to alter the engine’s static compression ratio – we now become our own design engineer. The typical result is that all, or most, of the factory-installed equipment is not up to the task of correctly supplying the engine with the ideal settings over the entire engine speed and load range. Modifications to the different systems within the carburetor now become mandatory if one is to extract the full performance potential from the engine in all areas. Submerging the carburetor and its components in a pail of carburetor cleaner for a few hours of soaking saves a lot of time in removing heavy deposits of grease and grime from the castings. When outlining any carburetor modifications, we must also consider that engines vary dramatically in size and/or displacement. Displacement is usually listed as cubic-inch displacement (CID), cubic centimeters (CC), or liters. For comparison, a 400ci engine is approximately 6.6 liters or 6,600cc. Engines not only vary dramatically in size, but also in compression ratio and power output. The most reliable test for leaking bottom plugs: apply a soap-and-water mixture over the plugs, then introduce high-pressure compressed air in through the front and rear jet openings in the fuel bowl. A small leak shows a tiny stream of bubbles. Large leaks as seen in this picture are easy to detect! In early years – well before any significant emission standards were imposed – carburetors were often matched very closely to the size of the engine and expected power potential. Carburetors are typically rated in their ability to flow air in cubic feet per minute (cfm). There are various formulas in place for determining the ideal cfm needed for any engine, based on its displacement and RPM potential. A “rough” racer’s formula is to simply double the CID of the engine. Although a crude measurement, it has proven to be accurate enough for basic carburetor sizing. No amount of effort spent on building a high-performance Quadrajet carburetor can be successful unless we are working with a correctly rebuilt carburetor. Over the years, I’ve come to hate the word rebuilt. Most things I see that are “rebuilt,” especially carburetors, were probably better off slam worn-out than after they were finished! This simply comes from lack of knowledge rather than lack of skills. Armed with accurate and usable information, we can make sure your Quadrajet carburetor is correctly rebuilt, and it functions as it was originally intended. Install the APT adjustment screw into the main casting. Make sure to put the spring in first and return the APT screw to the original setting recorded when the carburetor was taken apart. Working with a unit that is up to par, we can make metering and calibration changes to get the desired and predicted results. Most Quadrajets have experienced some wear through years of use and countless heating and cooling cycles in the engine compartment. This may leave some units in rather poor, overall condition. The decision to work on your current unit or select another core should be made after careful disassembly and inspection of the castings. Before going into specific rebuilding procedures, we need to go over a few of the common problem areas. Once you have inspected the carburetor and decided that it is in suitable condition to rebuild, you can continue on with confidence that the final product will work as expected. With a suitable core, it’s time to take it apart for cleaning, repair, and rebuilding. Close examination of the unit reveals a few minor problems in separating the three main parts if only the retaining screws were removed. Linkages run from one section to others and have to be removed prior to separating the components. The air horn should be removed first. 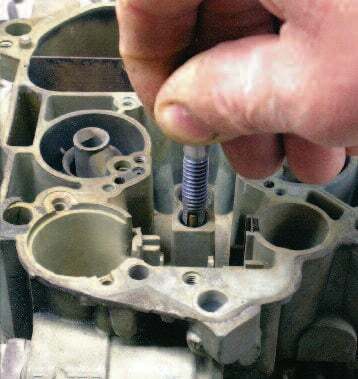 The carburetor should be placed on a wooden spacer or other suitable fixture, so that any downward pressure applied during disassembly is not transmitted to the throttle shafts. Before you can begin assembly, all parts need to be cleaned. All the small parts can be cleaned by soaking in a small metal pan filled with carburetor cleaner. After soaking they should be blown off with high-pressure compressed air. A soft-bristle brush helps with really stubborn deposits and corrosion. The base plate, main casting, and air horn can be submerged for cleaning. Several companies offer solutions designed for this purpose. The chemicals used are mild and much more user-friendly than in years past. They also don’t clean quite as well, but they still remove most of the heavy deposits. Once you have successfully cleaned the main components and all small parts, you are ready to put the carburetor back together. A 1/4-inch -28 tap is used to clean the threads in the fuel bowl prior to installing the jets. Any defects on the threads can damage the threads on the jets and prevent them from fully seating. With that done, attach the base plate to the main body. Make sure that you have chosen the correct gasket. Carefully line up every hole in the gasket with both parts. Some carburetor kits supply several different gaskets, as their kit may be designed to cover a broad range of carburetors. Prior to installing any new parts, we need to check a few items. Two common problems with rebuilt Quadrajets are sticking power pistons and poor fuel-delivery from the accelerator pump. Once we have successfully attached the base plate to the main body and have good alignment between the two parts, you are ready to start installing parts into the main body. Once you have followed Cliff’s guidance to reassembling the body, the air horn is now ready to install. A wide variety of rebuild kits are currently available for Quadrajet carburetors. The vast majority of these kits only contain gaskets and a few small parts, such as clips, seals, and a check ball. Most contain a new seal for the old accelerator pump instead of a new pump with a seal. They may also include an aftermarket replacement for the OEM-style fuel inlet seat and needle assembly. Most of these assemblies are very restrictive and do not supply sufficient fuel to the carburetor for any sort of high-performance application. Always use the factory-style fuel inlet and needle assembly. In order to make rebuild kits more universal, many companies include several different gasket sets. This allows a single kit to cover a broader range of applications. Always match up the gaskets in the kit to the ones removed, and check alignment of all holes between all of the components. This custom carburetor kit was provided by the Carburetor Shop in Eldon, Missouri. These kits include more parts than found in over-the-counter kits and are well worth the additional expense. A new float is usually not included and must be purchased separately. Factory-style floats should always be replaced during carburetor rebuilding. Modern fuels can be incredibly hard on the factory floats. They may have soaked up some fuel and become heavy. A heavy float does not provide accurate fuel control and is the single-most common reason that rebuilds meet with negative results. Now that you’ve learned how the Quadrajet works, how to correctly rebuild it, and what different models were available, it’s time to apply some high-performance modifications. With the correct modifications in the right places, the Quadrajet has no trouble being up to the task of powering your new engine combination. Even if you are still working with a basically stock engine, the modifications mentioned in this chapter help improve performance, drivability, and fuel economy. One modification that Cliff outlines, requires removal of the idle-mixture adjustment screws and enlarging the hole under them. Most late-model carburetors have very small holes present here. A good starting point is to drill the holes to .090 inch. This is fine for most applications and makes sure that it does not require turning the mixture screws out four, five, or even six turns to get enough idle fuel to the engine. A small amount of solder or lead can be melted into the power piston-bore to seal off the vacuum supply. Next, the Idle Bypass Air regulation is addressed. Adding idle bypass air is seldom needed with near-stock engines and very mild camshafts. The amount of bypass air to use varies greatly for different applications. For near-stock engines with no compression ratio increase and a slightly larger than stock cam, start out with .050 to .080 inch of idle bypass air. It is recommended that the holes be drilled slightly smaller than the desired size with a power drill, then final-sized to the desired dimension by hand using a pin vise to hold the bit. Also make sure that holes are drilled in the main body in the passages leading down to the bypass air holes in the base plate. Most early carburetors do not have the main body drilled or have provisions in the base plate for bypass air. It can be added, but precision measurements and drilling is required. For the early carburetors, it’s often just as easy to drill small holes in the primary throttle plates if bypass air is required. Although not quite as effective as using the bypass air system, it does help to keep the primary throttle plate angle lower at idle with big cams. Many late-model carburetors have the idle bypass air system in place, but no holes drilled through the passages in the base plate. Once you have completed the needed base-plate modifications, it should be fitted to the main casting. The book is full of sidebars that really dive into the processes. Modifying the idle system is the most important part of setting up a high-performance Quadrajet carburetor. It does not matter how well the carburetor runs at full throttle if it doesn’t have the engine idling well and providing clean/crisp off-idle performance. The vast majority of Quadrajets we encounter as cores have very limited idle-fuel capabilities. Typically, the newer the production date of the carburetor, the more stringent the emission standards were, and the more restrictive the idle-fuel capabilities are. Some very early models used pullover enrichment with larger brass tubes in the main fuel-supply passages. Another important thing to keep in mind when coming up with a recipe for your carburetor is that very small changes can have a significant effect on the results. In addition, almost every application is somewhat different. In this hobby, it is very difficult to build any two engines to exactly the same specifications or duplicate exactly what someone else is doing. You might even get all the specifications and correct parts to build your engine, and still end up with slightly different results. Little things such as deck height, camshaft timing, and torque-converter efficiency affect the engine’s operating characteristics when it is placed in service. All of the information contained in this article are excerpts from Cliff Riggle’s book. To get all the details, order your today. Although this overview covers only the basics, there is an untold amount of useful information that you should know about the Quadrajet carburetor. That’s why I felt it important to showcase this worthwhile book, and show you how you can get a complete copy that really gets into the meat and potatoes of rebuilding and modifying the Quadrajet. You can click here to get a 40-percent discount on multiple copies of Cliff Ruggle’s book: How To Build And Modify Rochester Quadrajet Carburetors.